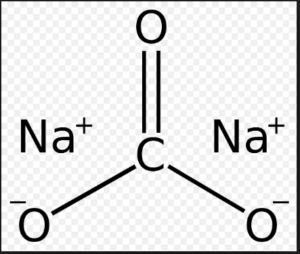 Sodium carbonate (also known as washing soda, soda ash and soda crystals, and in the monohydrate form as crystal carbonate), Na2CO3, is the water-soluble sodium salt of carbonic acid. Historically it was extracted from the ashes of plants growing in sodium-rich soils, such as vegetation from the Middle East, kelp from Scotland and seaweed from Spain. Because the ashes of these sodium-rich plants were noticeably different from ashes of timber (used to create potash), they became known as “soda ash”. It is synthetically produced in large quantities from salt (sodium chloride) and limestone by a method known as the Solvay process. By far the largest consumption of sodium carbonate is in the manufacture of glass, paper, rayon, soaps, and detergents. It is also used as a water softener, since carbonate can precipitate the calcium and magnesium ions present in “hard” water. Sodium carbonate is a food additive (E500) used as an acidity regulator, anticaking agent, raising agent, and stabilizer. Sodium carbonate is used in toothpastes, where it acts as a foaming agent and an abrasive, and to temporarily increase mouth pH. Mining: TRONA is the ore from where it is extracted. Several “halophyte” (salt-tolerant) plant species and seaweed species can be processed to yield an impure form of sodium carbonate, and these sources predominated in Europe and elsewhere until the early 19th century. SOLVAY PROCESS: In 1861, the Belgian industrial chemist Ernest Solvay developed a method to convert sodium chloride to sodium carbonate using ammonia.